Do you see the little black thing that is to the left of referee Joey Crawford's right shoe? 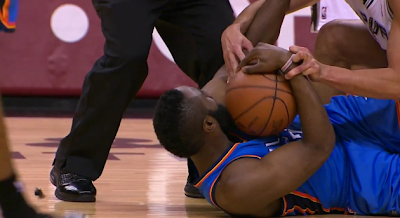 That would be Crawford whistle, which fell out of his mouth while James Harden and Manu Ginobili battled for a loose ball in the Spurs' victory in game 1 of the Western Conference Finals on Sunday night. Well the great Steve Kerr of TNT thought it was something else, possibly something that came out of Harden's fascinating beard. Let's go to the videotape.